Lucan is, as you may tell from the picture, a Viltrumite. 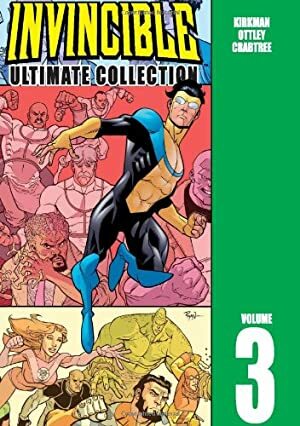 If you can’t tell from the picture that Lucan is a Viltrumite — presumably because you don’t read Invincible — we bemoustachedly recommend that you first read our Generic Viltrumite article. It’ll help a bunch. Base Of Operations: Mobile (presumably within the USA), the dark side of the Moon. Height: 6’4” Weight: 285 lbs. 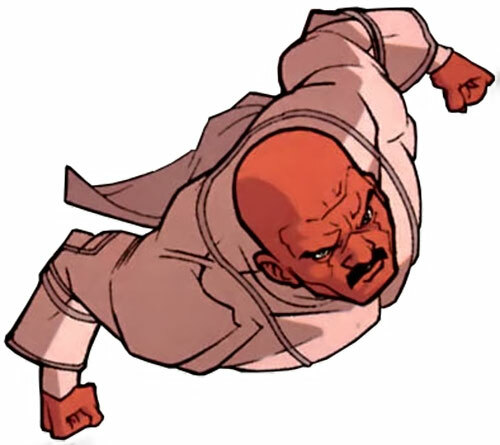 Eyes: Brown Hair: Bald (black mustache). Lucan possesses the vast superhuman strength that one would expect to find in a Viltrumite male of his age, height, weight and build who engages in intense regular exercise. Using the Marvel Handbook terminology, this places his strength level somewhere above the “Class 100+” range, allowing him to lift (press) weights far in excess of one hundred tons directly overhead. Lucan’s alien biology grants him superhuman strength, speed, durability, stamina and the gift of unaided flight. He possesses these traits at levels that dwarf those of all known Earth-born heroes and heroines. Like all Viltrumites, Lucan ages at a mere fraction of the rate that humans do. He can fully expect to live for thousands of years as long as he doesn’t meet an unexpected and violent end. Lucan is an experienced warrior and a skilled melee fighter (though he is clearly not as skilled as one would expect of a warrior who has lived over one thousand years). He presumably also possesses a layman’s understanding of Viltrumite technology and astrogation. Lucan himself has survived exposure to the original strain of the Scourge Virus, and is presumably immune to that specific strain. Finally, Lucan (like all pure blooded Viltrumites) suffers from an acute form of a rare behavioural disorder known as Intermittent Explosive Disorder (IED). It can be characterized by extreme expressions of anger, often to the point of uncontrollable rage, that are disproportionate to the situation at hand. In layman’s terms, it can take very little to cause a violent outburst from Lucan should he feel angry or frustrated. 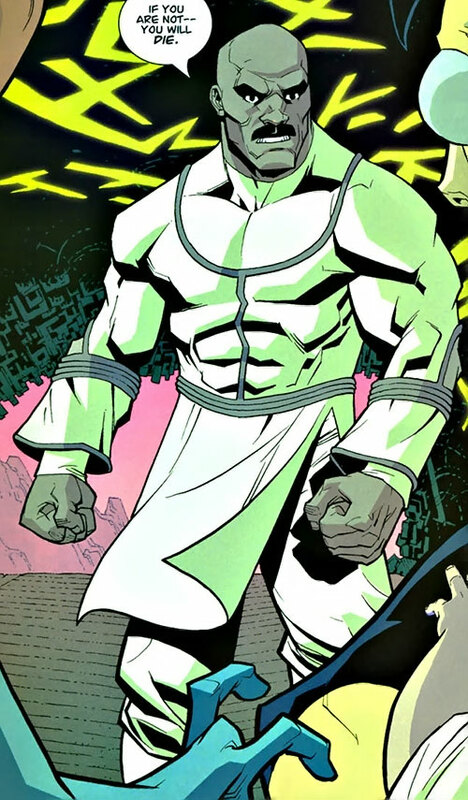 Lucan was one of the three Viltrumite warriors that appeared in the skies above Thraxxa when Omni-Man first attempted to desert the Viltrumite Empire. Lucan and his allies devastated the Thraxxan populace, causing the near extinction of their kind, until Omni-man came out of hiding and faced them in skies above the capital. While Omni-man fought his partners, Lucan surreptitiously followed Nolan’s son, Invincible, to a mass of dark caves which he had hoped would conceal his location. Lucan confronted Invincible in the caves, but was shocked into stillness when he discovered Nolan’s other offspring within them. His surprise lasted long enough for Invincible to take advantage of him and escape the caves. Enraged by his own stupidity, Lucan pursued Invincible in a blaze of motion. He very nearly caught him in the open skies of Thraxxa. As he closed the last few inches between them, Nolan slammed into the small of his back and drove him into the ground below. The two engaged in a titanic battle, which ultimately ended up with the far more experienced Omni-man literally eviscerating Lucan. Omni-Man left Lucan for dead and left to re-engage the remaining two Viltrumites in battle with his son. Unknown to Omni-Man, Lucan survived his assault and upon gathering his wits (and intestines) soared skywards in search for his would be slayer. Lucan found Omni-man standing triumphant over his allies, and used all of his remaining strength and speed to drive the full weight of his body into the small of Nolan’s back. Nolan’s spine snapped under the force that Lucan generated in that small area and dropped helplessly to the ground. After spitting a curse at the older warrior, Lucan quickly followed him into unconsciousness. The two were eventually recovered by a Viltrumite retrieval squad. Lucan was taken to a hospital while Nolan was taken to a heavy security prison. Lucan was next seen during the Viltrumite War. He was one of the three Viltrumites that were sent to confront the Grayson family when they first entered Viltrumite space. Lucan ended up fighting both Omni-man and his son Oliver, while Conquest battled Invincible to a standstill. Lucan did his best to defeat the two. But he eventually let them escape in order to turn his attention to their other allies. Lucan also participated in the war’s final battle over Viltrum. He was one of the many Viltrumites that ended up wounding Allen the Alien so severely that he was forced to leave the battle. At the war’s close, Lucan joined the other remaining Viltrumites in colonizing the Earth. He was given strict instructions to impregnate as many human women as possible in the attempts to bolster the Viltrumites flagging numbers. But Lucan instead decided to remain fateful to one of the humans that he fell in love with. He was awaiting punishment for his direct defiance of Thragg’s orders when it was discovered that Nolan was the true ruler of the Viltrumite Empire. He (alongside General Kregg, Anissa, and Thula) prevented Thragg from murdering Nolan outright. They very nearly beat him to death until Nolan ordered him to allow Thragg to live. At this time, Lucan is at least outwardly loyal to Nolan, and serves him as loyally as he did Thragg before him. 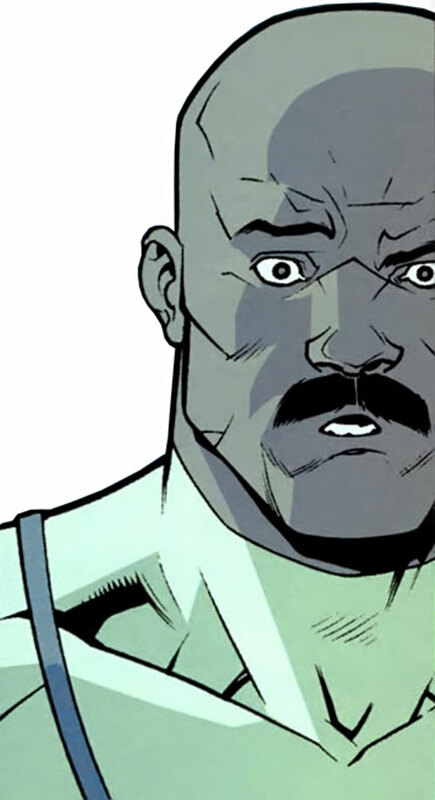 Lucan is a relatively handsome, bald Black man. He stands a few inches taller in height than Omni-Man and is decidedly heavier. He is built like a brick-house, with layer upon layer of thick and bulky muscle covering his massive frame. Lucan’s Viltrumite attire is typical of an average Viltrumite soldier. It is a form fitting white body stocking with grey accents. A large semi-circular swath of grey surrounds the neck of his uniform, and a thin strip of grey runs down the centre of its chest. Lucan embraced the typical Viltrumite ideals for the majority of his life. Loyalty to the Viltrumite Empire, strength, combat and glory in battle were all that mattered to him and were the only means with which he knew how to define his own sense of self worth. It was for this specific reason that he was utterly stunned and shocked by Nolan’s actions on Thraxxa and moreover, his fathering and protection of his imperfect son (Oliver). Upon his acclimatization to life upon the planet Earth though, Lucan may have been the one Viltrumite that had the most in common with Nolan. Unlike his fellow Viltrumites, Lucan has met and fallen deeply in love with a human woman who had suffered a great heartbreak earlier in life. Lucan desperately wants to maintain her happiness and has gone as far as to refuse the commands of the former Grand Regent Thragg to mate with other women. (After snapping Nolan’s spine in retaliation for being eviscerated) “Next time you kill someone — make sure they’re dead. Attack Vulnerability (-2CS vs attacks against the inner ear), Exile (Viltrumite Empire, Involuntary), Fatal Vulnerability (Scourge Virus), Gradual Loss Vulnerability (Scourge Virus, All Powers ot 0 APs and Physical Stats reduced to 02 APs, Rare), Loss Vulnerability (Klaxus Plant, All Powers and physical attributes reduced by 2CS, Rare), Minor Rage, Secret Identity, SIA (Battle), SPI (Intermittent Explosive Disorder). Writeup completed on the 2nd of September, 2013.